Keep your company in front of your customers, even when they’re snuggled up in bed with their favourite read. Perfect for gifts or to sell, people will hang onto them long after you hand them out. Our Economy stock is high quality at affordable prices. Quality bookmark printing services delivered to Melbourne, Sydney, and beyond! Despite the Kindle, Sony’s e-Reader and the iPad changing the way we access the written word, there’s still a lot of people who read it the old-fashioned way, in a book. This means that bookmarks are used by people of every demographic, from the young to expectant mothers to parishioners and the young at heart. Luckily it’s easy to create the perfect bookmark for your target market with our Luxury Uncoated stock, UV cured inks and fast turnaround time! Do you need lots of bookmarks that look fantastic but have a fantastically small price tag to match? Then these double-sided gloss bookmarks on our 310gsm stock are perfect for you! Choose from full colour one or both sides, plus an optional Spot Silver finish for added shine. We pride ourselves on high quality printed products with a fast turnaround time and excellent customer service. 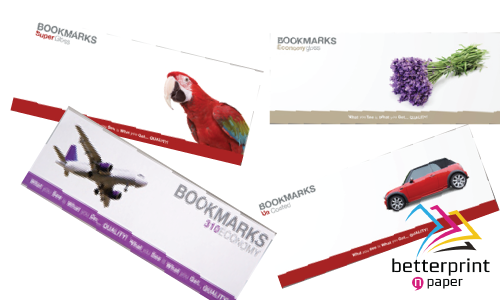 Should you order these bookmarks on the 310gsm stock with a single-sided matt stock, you won’t be disappointed. Despite the Kindle, Sony’s e-Reader and the iPad changing the way we access the written word, there’s still a lot of people who read it the old-fashioned way, in a book. Our gloss celloglaze beautifully brings out photographic images on bookmarks and it is for this reason some companies create collectible series of bookmarks. They could represent different elements of your business coming together to form one big picture or a stunning landscape image. Single-sided matt finish. 420gsm stock. What more really needs to be said about this option? Just that it will be printed with UV-cured inks on a waterless press, meaning it s even friendly to the environment. Use our 100% recyclable polypropylene stock to create a bookmark the recipients will keep forever! No accidental losing of their page or your marketing message. Print your logo and contact details in fantastic full colour one or both sides. Some libraries, particularly those catering for children, give a bookmark with the return date stamped on it with every borrowed book. If your customer is a library, this is the stock to be used, as it can be utilised in this very way. All parents know that with kids, whether it’s clothing, toys or bookmarks, there’s a good chance that it will either be outgrown or worn out quickly. For this reason, sometimes it’s best to save your cash and buy something with a small price tag. That could be the reason $2 shops are so successful! If your target market for bookmarks is children, this stock is the best choice. We deliver nationwide to capital cities including Sydney, Melbourne, Adelaide, Brisbane and Perth, and all surrounding regions. If you’re looking for the best quality printing in Australia, request a quote from the experts at Betterprint n’ Paper. 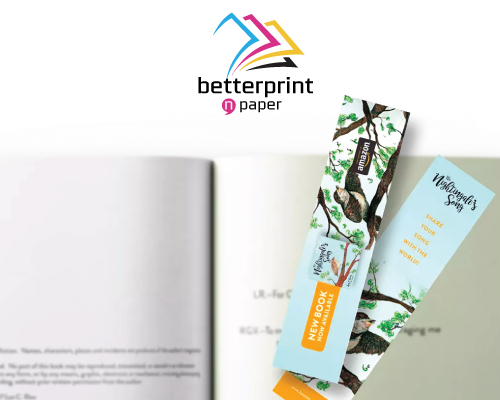 Betterprint n’ Paper doesn’t give pre-set pricing online for alot of products, talk to us about your specific requirements and we can work with you to get the best price point for your requirements.